Pool Chemicals & Testing. Spa Chemicals & Sanitizers. Sign up to receive special insider notifications of deals, promotions, and new items! 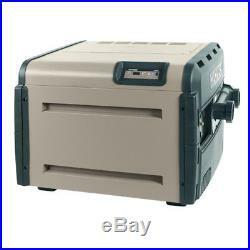 Hayward Universal H-Series 250k BTU Natural Gas Low NOx Pool Heater H250FDN. Universal H-Series Low NOx heater has an industry-leading thermal efficiency and complies with all current California air quality emission standards. The low NOx emission makes it a perfect choice for the environmentally concerned pool owner. Its hydraulic performance also saves energy by reducing the circulation time of the pump and it can raise the temperature of an 800 gallon pool 30 degrees in less than an hour. Other advances include stainless steel burners, corrosion-resistant heat exchangers and insulated Fire Tile combustion chambers. This traps the heat unlike other forms of insulation delivering the highest degree of performance from every BTU. Equipped with an LED control panel, it monitors heater performance for added convenience and maximum comfort with minimum effort. The ignition system delivers dependable lighting and reliable operations with just a touch of a button. The forced draft system constantly moves air through the combustion chamber to eliminate all outside weather variables affecting heating performance, such as wind conditions, eliminating the need to install a high-wind stack. Questions about this item? To make sure we get the order to you as fast as possible, orders are processed as soon as they come in. We cannot guarantee that any order can be cancelled once placed and processed. Included in this but not limited to are Heat Pumps, Gas Heaters, Large Filters, Slides, and Diving Boards. These products are delivered to the front of the driveway, not to the garage or installation site. The trucking company is not responsible to transport your items anywhere other than the front of your driveway. In this circumstance, we will call you with the additional charges. To help make this process as smooth as possible please follow these guidelines. Sign Bill of Lading (receiving bill). This document says that the order has been received. This all states that the order has arrived in good condition. It is the customer’s responsibility to inspect all packages received. This document also states the number of cartons you are receiving, please make sure this number is the same as the actual number of cartons received. It is your responsibility to make sure your order is in good condition upon receipt. Return must be in brand new condition. Here at Backyard Pool Superstore, we understand that mistakes can be made. All warranties are held with the manufacturers of the product. Backyard Pool Superstore will take care of this issue promptly and without any extra charge to you the customer. If you accept the product off of the truck, you now own the product. Please inspect all packages thoroughly before acceptance. Our staff is dedicated to making sure your experience with us is not only good, but the best! We are not just “Internet retailers”, we are pool and backyard professionals that have been in business for over 20 years. We pride ourselves on fast, professional customer service. We use the latest technology to assist you with your pool, spa, patio, and backyard needs. The Best Customer Service and Expert Advice. With many years of experience in all aspects of the pool and backyard industry, we are here to help you with all of your questions. If one of our staff members cannot help you immediately, we will not rest until we find an answer to your question. The item “Hayward Universal H-Series 250k BTU Natural Gas Low NOx Pool Heater H250FDN” is in sale since Thursday, February 4, 2016. This item is in the category “Home & Garden\Yard, Garden & Outdoor Living\Pools & Spas\Pool Equipment & Parts\Pool Heaters & Solar Panels”. The seller is “backyardpoolsuperstore” and is located in Multiple Locations. This item can be shipped to United States. This entry was posted in hayward and tagged 250k, h series, h250fdn, hayward, heater, natural, pool, universal. Bookmark the permalink.